As the movie opens, 14-year-old Ola is acting as sister, mother, and wife (from a housekeeping/running perspective) to her less-than-motivated alcoholic father and her unpredictable younger brother, Nikodem, who has autism. The trio lives in a small, somewhat squalid council flat; Ola and Nikodem’s mother, Magda, apparently left the family to have a baby and live with another man, though the full backstory is never revealed. Nikodem is preparing for his first holy communion, and Ola is determined for him to succeed, both to protect him from embarrassment and so that Magda will have a reason to join them for a celebration — and maybe be convinced to come back home. Ola seems to have left childhood far behind as she cares for her brother, quizzes him on scripture, explains away her father’s irresponsible behavior, and generally takes care of everything for her little family. The rare moments that she gets to spend with friends suggest that she longs for the life of a typical teen — but even those are often cut short by the needs of her father and brother. And just when it looks like all her work and planning have paid off, life zigs instead of zags … again. Sheila Roberts: In her feature debut set in today’s Catholic Poland, Anna Zamecka offers audiences an unvarnished story of courage, faith and perseverance against enormous odds. Her riveting documentary, Communion, features an impressive performance by 14-year-old Ola Kaczanowski who plays herself. Ola shoulders overwhelming adult responsibilities while attempting to hold her fractured family together, hoping to reunite her estranged parents in time for her autistic brother’s first Communion. The verite style story is lensed by Matgorzata Szylak whose camerawork skillfully reveals the intimate daily struggles of each character in the tiny, cramped apartment they share. Communion is deservedly a serious contender for this year’s Academy Awards and has been shortlisted for nomination in the Documentary Feature category. Loren King A biting slice of social realism, Communion signals Polish director Anna Zamecka, who makes a stunning debut with this documentary, as a powerful talent to watch. Read full review. Susan Wloszczyna: Just like Jennifer Lawrence in Winter’s Bone, who bore the burden of saving her family, Ola is a highly watchable character who keeps us fully invested in Communion. Read full review. Marilyn Ferdinand: Childhood can be a harrowing experience for many. It was for Polish director Anna Zamecka, who found a situation for her first film that mirrored in some ways her own experience of having to be the head of household while still a teen. Her central protagonist is Ola Kaczanowski, a 14-year-old girl who lives with her father and 11-year-old brother in a small flat in a town about an hour outside of Warsaw. Her father is fighting a drinking problem, her brother is autistic and unruly, and her mother lives somewhere else with another man with whom she appears to have had a baby. Nothing is exactly spelled out in this documentary; we just witness the never-ending tasks with which Ola is faced, from having to tie her brother’s shoes and working a broken-down washing machine, to ironing her father’s shirts on a wooden stool—all with a scowl of unhappiness and resentment plastered on her face. I don’t know how Zamecka was able to get so close to these people, but they hide nothing. The result is an indelible portrait of survival and its costs. Pam Grady: Anna Zamecka’s indelible verite documentary offers a portrait of Polish tween’s life that is downright harrowing. Ola has way too much responsibility resting on her thin shoulders, responsible not just for her own studies, but also for getting her younger, mentally disabled brother’s ready to take his First Communion; keeping house; and trying to keep her alcoholic father sober. Scenes at a school dance and of Ola hanging out with her friends serve as a reminder that this girl is still a child and one growing up too soon in a profoundly dysfunctional household. Zamecka clearly gained the family’s trust; Communion is so strikingly intimate in its observations of their lives. With this, her debut film, a story efficiently told in a scant 72 minutes, Zamecka leaves a calling as a talented director with a bright future. MaryAnn Johanson Anna Zamecka’s debut film is a stunning testament to the female perspective that is sorely lacking from cinema. The intimate access she has to her subject, young Ola, would not have resulted in anything half as profound as it does without Zamecka’s ability to fall back on her own experience as a girl in a world where “women’s work” is too often done without being acknowledged, noticed only when it is *not* done. Even something as simple as holding her baby half brother becomes a sly commentary on the unseen work that girls and women do merely by the filmmaker holding the camera steady on Ola while activity bustles around her. Brava. Jennifer Merin Communion, first time filmmaker Anna Zamecka’s documentary, is about Ola Kaczanowski, a Polish teen upon whose shoulders rests the sole responsibility of keeping house and caring for her well-meaning but hopelessly alcoholic father and her mentally challenged younger brother, whom she is preparing for his first Communion, an event she hopes will reengage her emotionally detached and physically estranged mother, who lives elsewhere and refuses to have much to do with Ola, except to consistently reject her daughter’s pleas for help. Zamecka’s storytelling style is pure verite, presented without voice overs, talking heads, interstitial expository verbiage. Her intimate access to her characters in their small, cramped dwelling is extraordinary. As Ola’s woes unfold before Zamecka’s fly-on-the-wall camera, this grownup-before-her-time young girl captures your heart. Communion is short listed for this year’s Academy Awards. Kristen Page Kirby It would be easy to say that Ola Kaczanowski, a teenager caring for her intellectually disabled brother and alcoholic father, is the heroine of Anna Zamecka’s Communion. That implies, though, that Zamecka intended for her audience to see Ola that way. Instead, Zamecka’s camera shoots without artifice, judgement or even suggestion as to what “roles” the members of this family might play. Instead, Zamecka films with empathy, allowing the audience to form their own relationship with the teen forced to become an adult too soon. Communion is without a heroine, without a villain and only a simple quest — and, in that way, it’s like life itself. Elizabeth Whittemore Ola is a young girl with the weight of the world on her shoulders. As the main caretaker of her neurodivergent brother and alcoholic father, she desperately clings to the idea that things will improve if her estranged mother returns to the household. Director, Anna Zamecka, has given us a verite doc that will break your heart. Okay not only cooks, cleans, and looks after her brother, but has to prepare him for his first holy Communion; a feat for any child and a should know as former Catholic elementary school graduate. It’s frustrating to watch this beautiful you girl be emotionally abused, leading her to cover for the failing adults in her life. It is a glimpse behind the curtain of a population in every developed country. The children left behind in a system not up to par. While this story takes place I. Poland, it could so easily be in the U.S. Communion makes many references to happiness in the film but it’s the last thing you’ll find. Sandie Angulo Chen: Polish filmmaker Anna Zamecka’s debut documentary Communion is a cinema verite-style doc about a middle school-aged girl named Ola who’s saddled with a host of grown-up responsibilities that would feel burdensome to adults three times her age. 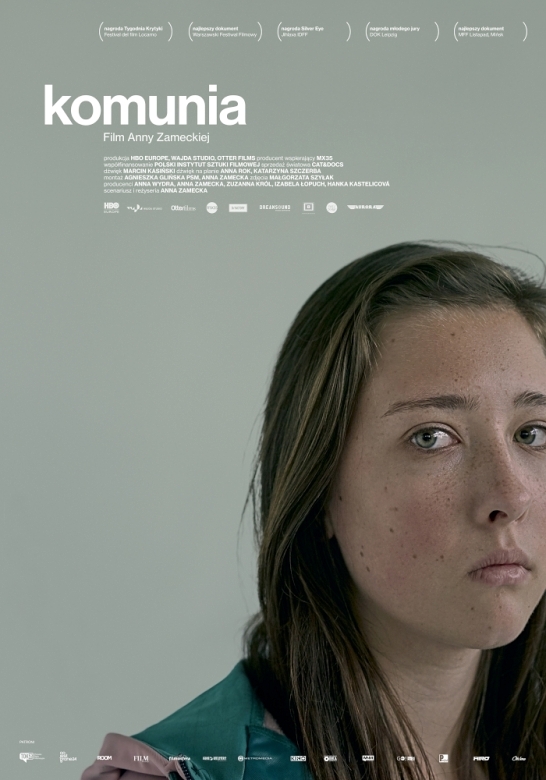 Ola’s home life on the outskirts of Warsaw is troubling: bumbling alcoholic dad Marek, MIA mom Magda, who has started another family, and an autistic slightly younger brother, Nicodem, and she is forced to run her small household. Ola does everything from cook meals and clean the tiny flat to take care of her special-needs brother Nicodem, who is preparing for his first communion (a few years later than usual, because he’s on the spectrum). Zamecka tells Ola’s story with just the camera capturing her ongoing struggle to basically raise not only herself but her brother under unhealthy circumstances. A quietly powerful and sad film. Cate Marquis Filmmaker Anna Zamecka makes an impressive directorial debut with this story about 14-year-old Ola Kaczanowski and her family. The documentary uses an unobtrusive fly-on-the-wall approach without narration, as we watch as Ola handling all the household chores. Read full review.